One of my favorite things to talk to people about is food. In my job I an encounter a wide range of foodies to bounce ideas off of. A few weeks back I was trying to come up with a new cake to veganize so I was asking someone what their favorite cake was and believe or not they couldn’t come up with one. Days later the same person called and said “Buckle.” I was a little confused and then they explained that they had always heard talk of a Plum Buckle cake but never tried one and didn’t even know what it was. This was the perfect challenge because I had never heard of one either. For the next couple days in my free time I took to the web to read about buckles. I found a nice little history lesson (hey, I’m a nerd and love the history of food.) Doing the research I found that buckles were most traditionally made from blueberries which I attempted a version of first for a bake sale at Sidecar For Pigs Peace which I called a Blueberry Lemon Cake. The reason it is called a buckle is because the batter buckles over the fruit when baking. It is basically a fancy coffee cake and would be perfect for breakfast or brunch. Being the silly goose I am, I decided to attempt to take this buckle idea and make it into a layered cake. Well, it FAILED. My mom has gotten frustrated with me many times over the years because I refuse to make a recipe as it is before messing with it. When I destroyed this one I could hear her telling me “I told you so,” in the background. Back to the kitchen to try again. This time around I opted to simply attempt to veganize the initial recipe and it came out wonderful. 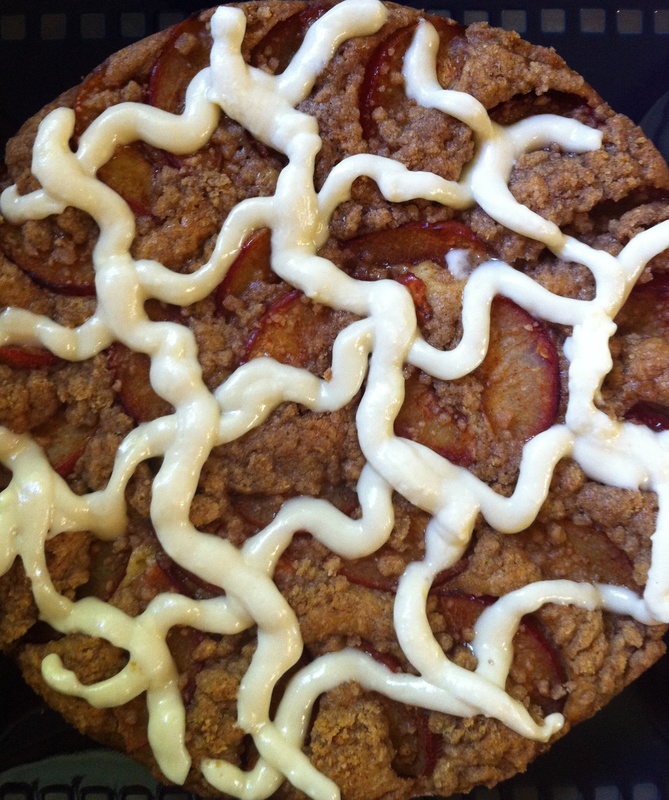 *Most buckle cakes I found recipes for did not have the streusel like topping. For me, anything with cinnamon and sugar on top is automatically better so I had to add it. *The icing was only used because I had left over from the Blueberry Lemon Cake. It tasted good but is not needed. If you wanted to had it you could easily mix together a couple of tablespoons of vegan cream cheese, powdered sugar, and vegan butter. I threw mine in a plastic bag, cut off the tip and squeezed it out. In a bowl cover the plums with the other ingredients making sure they are evenly covered. Let sit while making the rest of the cake. In a bowl mix the above ingredients together so that they are crumbly. It took me a few tries and I found it easiest to do with my fingers. When I did it with a fork it still came out as one big clump. However you choose to do it, just remember you want crumbs. Ok, before doing anything mix your flax meal with the water using a fork or whisk and refrigerate for at least 15 minutes. This is a fairly recent trick I have learned from Bonzai Aphrodite but it really makes all the difference. If I know I am going to bake I will make it as soon as I walk in to the kitchen. They can sit more time but don’t cheat on the 15 minutes. For this next step I used a Cuisnart Smart stick, if you don’t have a wand of some sort you will want to use a mixer of some sort because this part of the recipe needs to get foamy. In a bowl mix ingredients from brown sugar to maple syrup with a spoon. Pour in flax mixture and with mixer of choice mix for a minute or so until it becomes foamy. Pour liquid mixture into flour mixture and stir until well blended. This is a very thick batter so don’t be alarmed. Pour batter into cake pan and with a spatula spread around so it covers evenly. Tap bottom in order to get out air bubbles. Press plums in cake fairly close together. 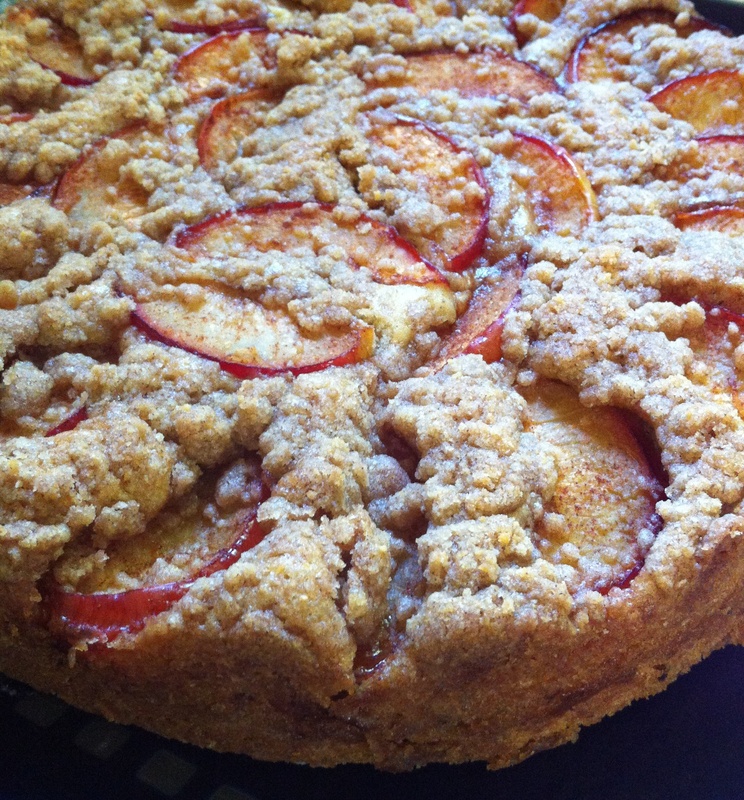 Sprinkle streusel over batter where there are no plums. Bake for 50 to 60 minutes until you a tooth pick comes out clean when stuck in the middle. Cool for thirty minutes. Gently flip onto cooling rack, remove parchment paper and then flip immediately back onto plate. Ice if desired. Serve. Gallery | This entry was posted in dessert. Bookmark the permalink.